Attraction Nearby - WELCOME TO AB MOTEL, LANGKAWI, MALAYSIA. First Time in Langkawi ? ​ If this will be your first visit to Langkawi and can't roughly figure of what to do...yet. I will try my best to share some information for nearby attraction. 1. 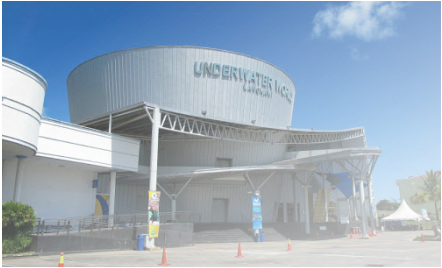 Underwater World Langkawi - one of the largest marine and fresh water aquaria in South East Asia. Since the start of its operation on 26 August 1995, it has become one of the must visit tourist destinations in Langkawi and has attraction a large number of foreign as well as local tourists. Unique to Underwater World Langkawi is the gigantic 15-meter long walk-through tunnel consisting of 500,000 litter seawater which houses many big fishes and sea creatures. 2. Langkawi Cable Car - Panorama Langkawi SkyCab is not just about cable car ride. We have lots of other attractions and activities as well that you can try and you will surely love it. Activities that you may find fun, relaxing, engaging, nature alike, extreme and captivating. All of these activities just in one place come and explore it. SkyCab - the steepest cable car ride on the earth and takes visitors up 708m above sea level to Langkawi's second highest peak of mt. Machinchang, where the view of the surrounding islands is simply breathtaking. enjoy great views of the hillside flora, waterfalls and occasional glimpses of the wildlife and birds. SkyBridge - the curved pedestrian bridge is built atop Mt. Machinchang at height about 700m above sea level. Accessible from the Top station, the bridge is suspended from a 82m high single pylon and hangs at about 100m above the ground. It swings out over the landscape to give visitors a unique view of the surrounding area. SkyPos - offers visitors to our picturesque mountain top destination the opportunity to share their " I Was Here" moment with their loved ones back home by posting a postcard, letter or greeting card via a specially placed POS Malaysia post box at the Top Station, atop Mt Machinchang. 6D Cinemotion - is a combination of 5D special effect seats and 3D Streoscopic movie. Various combination of special effects such as leg sweeping, lighting, snow, spraying water, wind blowing, bubble, smog and so on. 3D Art Museum​ - Located at the vicinity of Oriental Village, with 21,000sq/ft build up, it will featured more than one hundred 3D interactive paintings, artistically painted by renowned artists. This is yet another signature product by Langkawi SkyCab in collaboration with Art In Paradise Langkawi providing new dimension and experience to visitors. 3. Dataran Lang, also known as Eagle Square, is a striking 12 metre-tall sculpture of an eagle poised to take flight is display atop an elevated platform. Set in Kuah, this prominent landmark is just a five-minute walk from Kuah Jetty, Taman Lagenda Dalam Langkawi, as well as numerous restaurants and duty-free shops. Dataran Lang also houses beautiful miniature fountains, terraces and bridges, while its close proximity to the sea makes it a popular spot for watching ferries ply across the harbour in the evening. Dataran Lang is one of Langkawi's best known man-made attractions, a large sculpture of an eagle. A sight that greets visitors to the island via ferry, the statue is one of the island's most instantly recognizable monuments.